Source: Daniel H. Kim (2002). Ocapi uses 41 properties to assess your team's condition. The properties are described in simple terms such as "Thanks," "Trust," "Positive Thinking," "Ownership." This supports your team members to share a concrete picture of what is actually happening in your team. Helps improve engagement within your team members. Allows your team members to work on raising their engagement by indicating the three factors that show the level of engagement within your team: Contribution, Fit, and Camaraderie. Engagement is the dynamic relationship between an organization (i.e. a company) and its members, and how they contribute to each other’s growth. 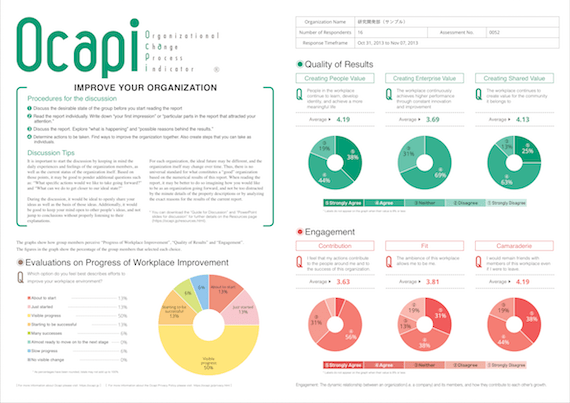 Ocapi reports provide a common language to discuss the condition of your team, making it easier for each member to share their views and feelings about the team. Inquiry into various interpretations on why some properties score high or low, can promote deeper understanding of the team’s situation. This can enable members to find ways to improve the team together. Know your team. Open up conversations. 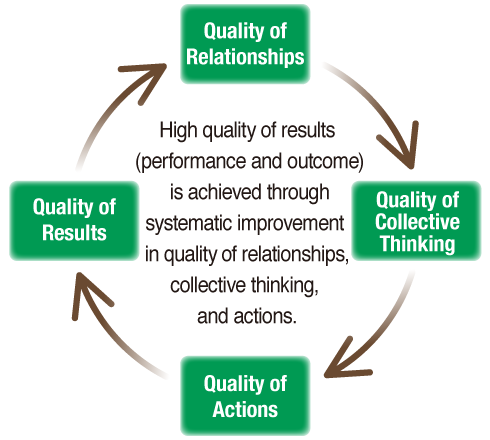 Ocapi uses 41 properties that indicate a team's quality of: relationships, collective thinking, and actions. Additionally, you can know the level of engagement within the team. Based on the entire report, your team can generate new ideas on how to keep improving. STEP3: Discuss the report and explore what is happening. 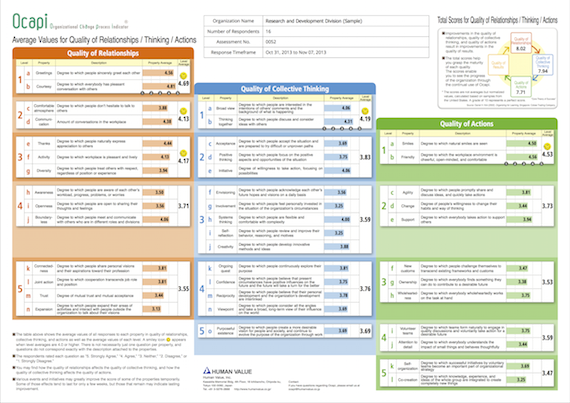 Download the "guide for discussion" (procedures and keys for the discussions with the reports). Create a new assessment and prepay by credit card (number of participants × 500 JPY). Participants will answer assessment questions using a computer or smartphone. 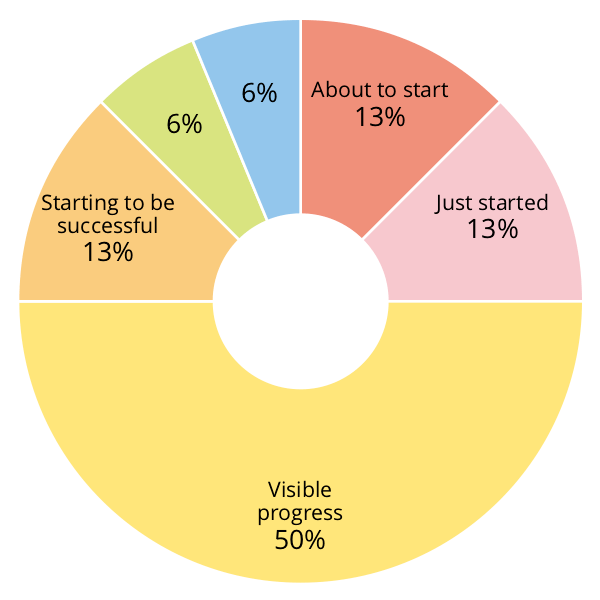 Once all participants complete the questionnaire, output a report simply with one-click. I use Ocapi in the beginning-of-year team meeting. The meeting is aimed to discuss the individual development and teamwork for the year. I repeatedly tell my team members that "Without the development of each member, the business won't grow." So I decided to hold two separate meetings. One is the "strategic meeting" where we design the business strategies. The other is the "team building meeting" where we acknowledge the individual development of each member and discuss our teamwork. 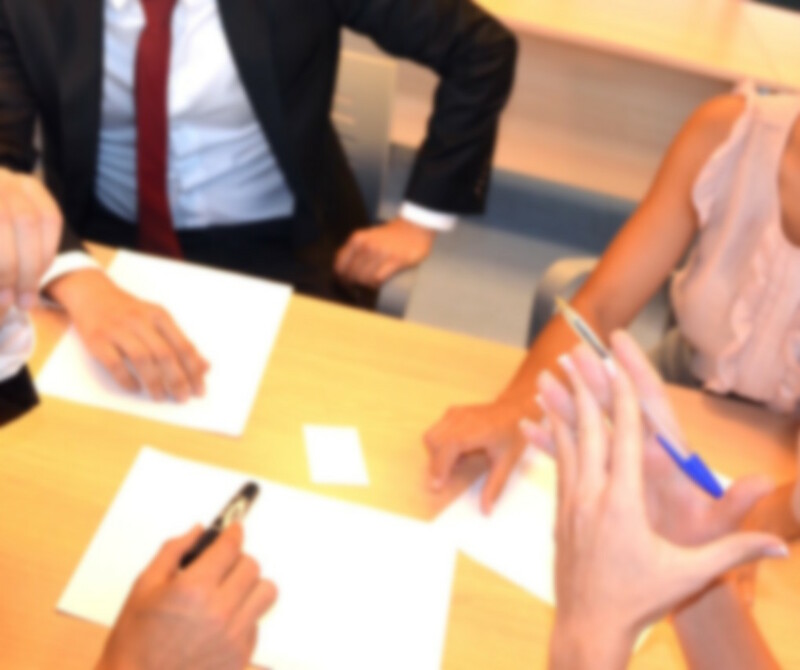 When we talk about business, it's easy to grasp the situation in concrete numbers, but for teamwork and relationships, it's difficult to communicate in numbers and usually the meeting ends as just "a fun experience." I've been looking for a way to keep a record in numbers along with the stories on what we enjoyed and what we put a lot of effort in every year. We had nine team members. Two of them were new. Several members were going to go on maternity leave or move out of the team within a few months. We were able to have a discussion free from roles and positions. The people who take leadership roles in daily work didn't take control, and the members didn't wait for the leaders to state their opinions. The score for level 2 of quality of relationships was high. We recognized it was true that we said "thank you" to each other quite frequently. We also discussed why the scores for "Involvement" and "Creativity" were low, because we thought we were quite positive in taking challenges. The action we decided on in the end was called "stay five minutes ahead." We will gather five minutes ahead of the actual time each meeting starts. When the quality of actions in our team improved by trying to start five minutes ahead of the time, we realized that it also had positive influence on the quality of relationships. For example, people gave a call whenever they were running late, which created an atmosphere to respect others who can "stay five minutes ahead." Also, when a new member joined our team, team members (not the leaders) voluntarily explained what "stay five minutes ahead" meant and why we started it. We weren't trying to be on time because we were afraid of being blamed or because we wanted to avoid causing trouble to someone. We created a new meaning that "staying five minutes ahead" was a way to demonstrate "involvement." Six months after we tried Ocapi for the first time, we decided to use Ocapi again. Six of the nine members were new to the team at that time and we didn't know each other very well. The action we decided on this time was to "finish work early on the second and third Wednesdays to go for a drink." We all were vaguely aware that we should finish work and leave earlier, but we also shared honest feelings that we felt guilty of leaving early when others were still overloaded with work. We agreed that it is difficult to switch on and off without making it a rule among ourselves. After the discussion, we started to cooperate to ensure that we all can leave work early. There was the manager, group leader, engineers… It was a team composed of 12 people with diverse backgrounds. Not all the members of our team participated. Only the people who were able to gather for the discussion responded to the questionnaire. We first experimented in the Human Resources division. At first, we thought of having the whole company of 50 people to participate. But we decided that we wanted to try it by ourselves first. So, the three executives did it first. I used it in a study group with members from different companies in different industries. We thought it might be effective to use it in a project team that promotes regional revitalization. So we tried it first with our team of ten members. The team seemed to be just the sum of individuals, and there wasn't enough synergy between the team members. We always just did things in the same manner as before. We started to wonder whether we were really improving as a team. We also felt the need for a change. So we decided to try Ocapi when the new year started. When we tried it in a technical division, the people at the front line sensed that the problem didn't exist in the level of expertise. It was rather in the relationship between the people. They became interested in Ocapi. Two companies merged into one. We wanted to assess the climate by using Ocapi. We wanted to change the culture so that the line mangers can cooperate as one team. So we asked the 12 line managers to consider themselves as the "line manager team" and to evaluate the teamwork among them. I was over-anxious that my members would say "I'm not up for it," but, to my surprise, there weren't any clear objections. So I did it. When my manager told us we are going to try Ocapi, some said "What for?" and others took some time to respond to the questionnaire. Still, the manager said "Let's do it," so eventually we all completed it. I just messaged all the members on Facebook, saying "Why don't we try this?" There was no one to complain. Some even thanked me for it. 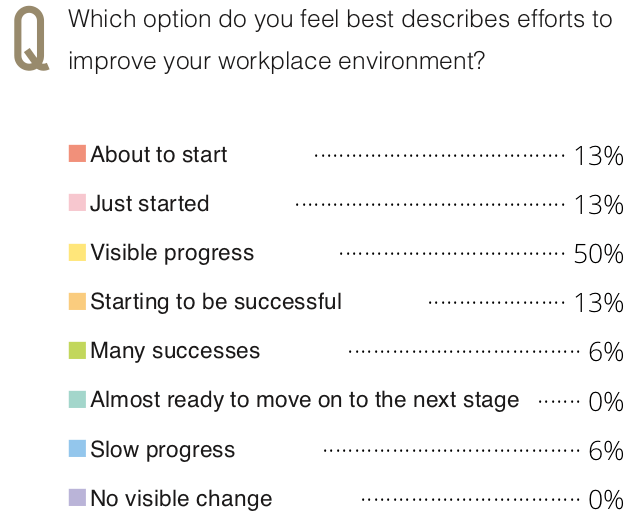 There were many sticky-notes, saying things like "I want to do better" or "I want to improve our workplace." In the beginning, we were just spending the time, saying superficial things. However, somebody's comment, saying he wanted to have more frank discussions became a trigger to change the scene. Members started to share their thoughts and backgound with others. I left everything to a veteran — occasionally stubborn — member to facilitate the discussion. All she did was to follow the "guide for discussion" downloaded from the Resources page, and read the phrases word by word. She was not a professional facilitator, but she tried hard on her own trying to do the best. Everyone felt her effort, so they also tried to do their best to follow her instruction and wrote as many sticky-notes as possible. It turned out to be a wonderful discussion. We shared the notion that there's no wonder we have NO smiley icon. The team members were too busy and it was difficult to schedule the date/time for the discussion. We had to postpond the scheduled meetings over and over. We ended up having it with only seven members out of eleven. Even more, other things happened. The facilitator said "Sorry, I've got to go" and left in the middle of the discussion. It was definetely not the ideal form of discussion we wanted to have. However, it was a valuable experience. One of the newbies changed the course of the discussion. We even extended the discussion time to share the desirable state of our group. We all thought we were able to say anything frankly to each other. However, in the discussion, things we usually don't say started to come out. Although we started out from "talking nice," as we followed the "guide for discussion," all of us started to wait for the opportunity to speak up and share the points that caught our attention. Things we would hesitate to say in our daily conversations such as — "We do respect each other but we try to avoid uncomfortable conversation," "We always laugh things out to ignore some things," or "Our team can't become a game-changer in our company" — came out in the discussion. Each one of us had totally different backgrounds – we only gathered for our personal growth. However, we started to wonder if we really wanted to become a team in the first place. Somebody said "We do take actions, but never reflect on them." We all agreed we can never create a change like that. Some of the new members never really talked about what kind of relationships they wanted to build with others. When one of them started to talk about it, the manager realized they do care. The President always talked about how he wants the company to be in two years, but we realized those are limited to specific indicators in the quality of results. In this discussion, we had an opportunity to hear from the front-line managers and create a common image of what we want in terms of quality of relationships, thinking, and actions. Three members who had always waited for the management to provide directions changed their attitude and said "We are going to steer our own team." Members said "Let's take Ocapi once in six months." We felt some kind of a hope that our team could really change. We could not find the exact words to explain our experience in the discussion to others who were not there. We all started to feel like "I am a part of the team." We decided to change the format of our regular meetings to spend the first 20 minutes on casual conversations. It was really an easy-to-do, as well as easy-to-continue action plan. When we reflected on the whole process, one of the members who had kept saying discussions are not necessary said "It was great!" We agreed that the discussion was the best part. It was interesting when we talked about what a good team really means in the after-hour drinking. Some say unity is important, others say a group of professional adults who complete work without complaining is ideal. We all had different opinions on what a "good team" looks like. It doesn't really matter how high (or low) we score. Ocapi was useful as a tool to start the conversation. Actions that are not directly linked to business strategies, but are necessary for our team came out. Ocapi is great because we don't lose focus of our discussion by using the report with specific scores. We were able to talk about the interpretation of these numbers. We accepted the scores as they are and discussed where they came from. Since the Ocapi reports show the current situation of the team quite obviously, members naturally start to talk about their honest feelings for the team's condition. It only costs 500 yen per participant, so it's not such a big deal even if we try it with 100 people. You don't need to add anything unique to the process — just download the documents from the website and follow the instruction. I especially thought that it was effective to write on sticky-notes before you start talking. You will not be influenced by other people's opinions. It was good we shared our opinion that we all have a similar "desirable state of the team," but aren't making enough effort to make it happen. It was a good thing that we decided to try Ocapi because we wanted to. Unlike other survey tools, it's all up to us whether we do it or not. Ocapi is something you just do casually. There's no need to be too serious. The discussion in Ocapi is more natural compared to that of a formal workshop or conference. We can hold the meeting as a part of our daily activities. These comments are excerpts from meeting notes of a "Ocapi Users Community" gathering.